If you are travelling to Paris and either have already seen or aren’t interested in visiting the top tourists sites there are plenty of other places to see. Here are alternative Paris Tourist Attractions that aren’t the famous Eiffel Tower, Notre Dame or the Louvre. While many people head straight for the Eiffel Tower to get a beautiful panoramic view of the city, why not head to a skyscraper that includes the Eiffel Tower in the panoramic. The Montparnasse Tower is 210m tall and consists of 59 floors. For a fee the public can go all the way up to the 56th floor and take in an amazing view of the city below. This is especially beautiful at night when the city is lit up. La Promenade Plantee, also known as The Green Walkway, is a 4.7km outdoor walk that is 3 stories above ground. It is the world’s first elevated park and runs along the abandoned 19th c. Vincennes Railway line. It is now outlined with cherry trees, maples, lavender and beautiful shrubs. While this may not seem like the first place to visit when you think of Paris, the Les egouts de Paris is a tour that you won’t forget. It gives visitors a glimpse into the sewers of Paris that date back to 1370. The exhibition shows the water cycle in Paris and is only a 20-30 minute walk, and no, it doesn’t smell. At least not too bad. 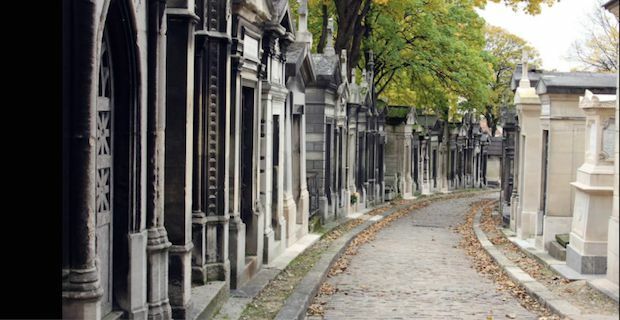 This may seem rather morbid, but Paris has some of the most beautiful cemeteries around, especially Pere Lachaise Cemetery and catacombs where you can walk along the cobbled path with beautiful trees and visit the graves of Jim Morrison and Oscar Wilde.